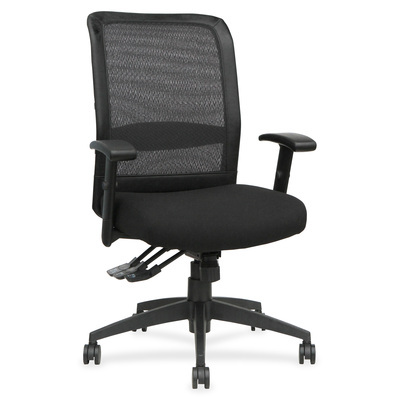 High-Back Chair Offers A Flexible Mesh Back For Breathable Comfort, Adjustable Lumbar Support, Cushioned Fabric Seat And A Steel Frame Back For Strength. Arms With Polyurethane Padding Adjust In Height So You Can Find Just The Right Arm Position. Chair Offers Many Functions So You Can Adjust It For More Efficient Seating. Seat And Back Angle Adjust With A Single Lever. Other Functions Include Pneumatic Seat-Height Adjustability, 360-Degree Swivel, Infinite Locking Within A Fixed Range And Tilt Tension. Five-Star Nylon Base Is Equipped With Five Casters For Easy Chair Movement..
High-Back Chair Offers A Flexible Mesh Back For Breathable Comfort, Adjustable Lumbar Support, Cushioned Fabric Seat And A Steel Frame Back For Strength. Arms With Polyurethane Padding Adjust In Height So You Can Find Just The Right Arm Position. Chair Offers Many Functions So You Can Adjust It For More Efficient Seating. Seat And Back Angle Adjust With A Single Lever. Other Functions Include Pneumatic Seat-Height Adjustability, 360-Degree Swivel, Infinite Locking Within A Fixed Range And Tilt Tension. Five-Star Nylon Base Is Equipped With Five Casters For Easy Chair Movement.